Shannon and I are early risers... some days we rise earlier than normal and Sunday was one of them. It was his birthday and I had plans on getting up and making a great breakfast before church. But at 4:30 am, we both woke up. 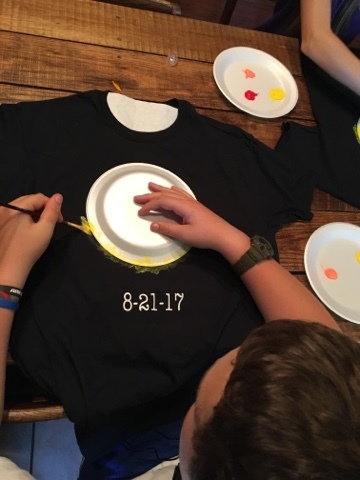 After laying there a few minutes, my head started swirling of ideas on how to make Solar Eclipse '17 and Happy 1st day of Homeschool 2017/2018 a memorable day, and I just couldn't go back to sleep. And so I asked him if he wanted to go with me to Walmart. He laughed at me, and we talked about it a few minutes and then he said, "Yeah, let's go!" 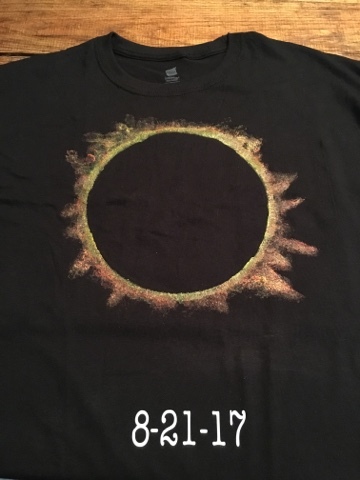 My idea was that we would make some t-shirts for the eclipse. 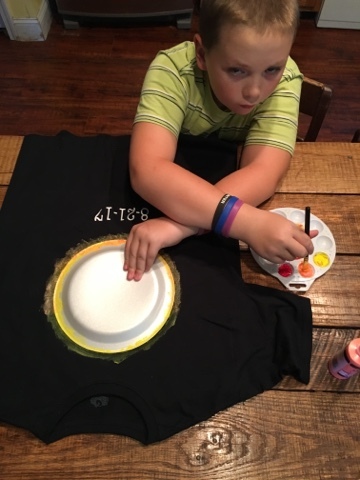 I thought if we used a paper plate, we could paint around it in sunny colors and it would look like the sun was covered by the moon. 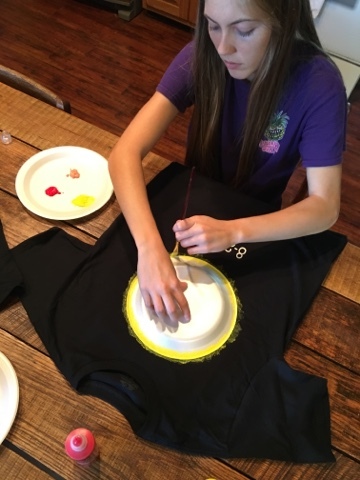 I saw several screen printed eclipse shirts on pinterest, but I knew we could replicate something just as good and it would be a lot of fun doing it. T-shirts were on sale last time I was there, so I had a good feeling they still would be yesterday morning. I bought the t-shirts and 3 bottles of fabric paint. The rest of the supplies were things we already had at home. 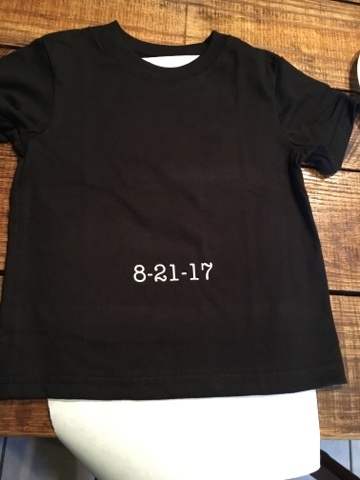 I also used my Cameo Silhouette to print off some iron on dates for our shirt. Super fast, easy and just a little bit of vinyl for this project. 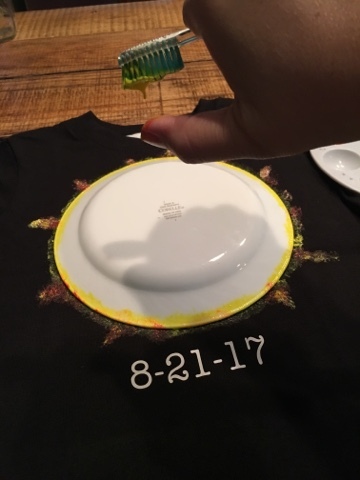 I placed the plate on the shirt to give us a guide as to where to iron on the date. 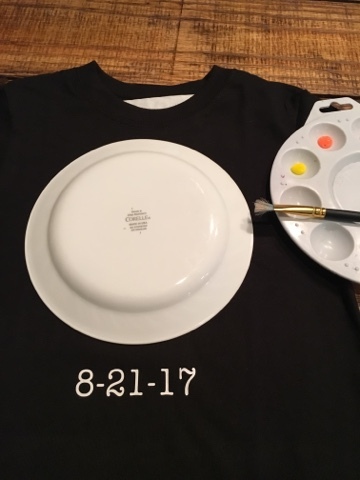 Once we had the dates ironed on we were ready for painting! 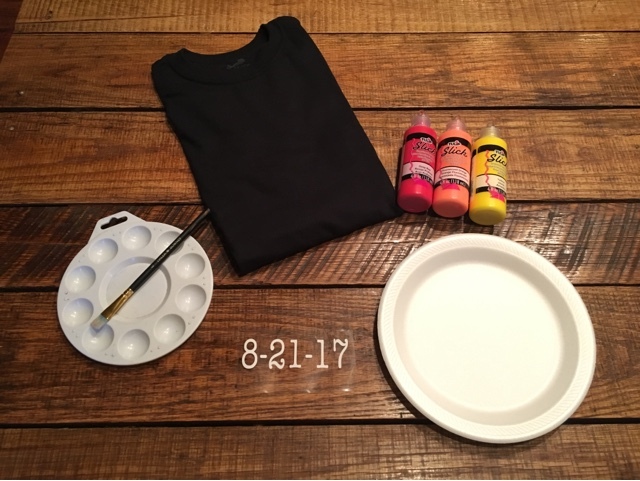 I placed a piece of wax paper inside the shirt, just in case the paint became a little heavy and wanted to bleed through to the other side. 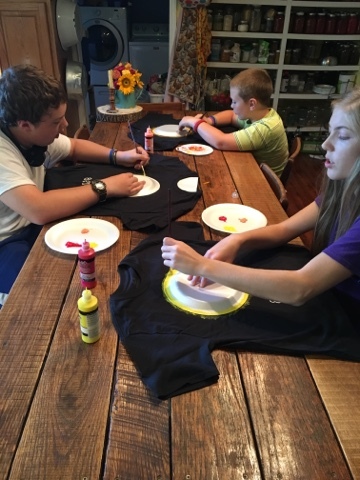 Then we placed our plate and began painting. 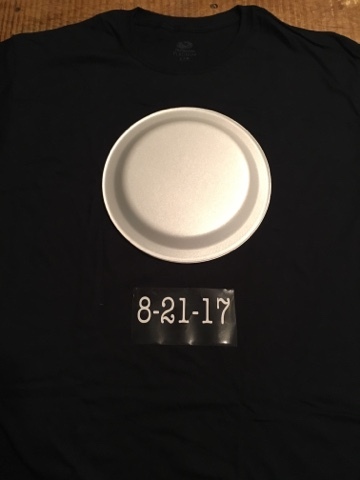 I had to use a dessert plate on the baby's shirt. There is no way on this planet that we could make ourselves one and not have one for our favorite little buddy. I started with a strong yellow edge around the plate and then ventured outside it with red, and orange, and then a mixture of them all. Simulating solar flares. Also you can take an old toothbrush and flick paint to make splatters if you like! 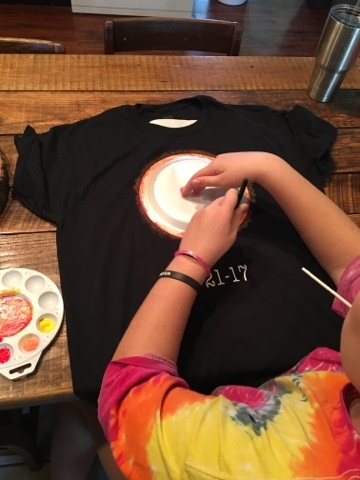 Each kid had their own ideas for how they wanted to make their shirts. I loved how different they are. It was a real treat to have Cameo home to make these with us. She is such a busy young lady nowadays, it's hard to get us all home at the same time. But I count it a treasure anytime we are all together. We let them dry and plan to wear them today! I hope you have a wonderful day and take the opportunity to enjoy the eclipse and spend a few minutes in adoration and thankfulness to the One who made the sun, moon, and the stars. Thank you, Lord. You are worthy of our worship.